Yes, I’ve said it. I’m already prepping for Christmas. I’ve decided that this year, instead of knitting gifts, I’ll be giving the majority of recipients edibles. It’s nice to change things up a bit. So, what you see above, is the orange peel getting a nice syrup bath. The recipe says not to let the mixture burn, so I kind of obsessively hovered over it. And in the process gave myself an orange-scented steam facial. The peel bits are now drying out before I dip them in sugar. If they taste as nice as they smell, they’ll definitely be a gift option. So, Krisi and I have decided that now that we both live in London, we should try to meet up more often than once every 2-3 months. Which is still more than what it used to be (once every six years or so!). With that in mind, she is also on a mission to find the best raspberry tart. We’ve agreed to meet up once a month to try new patisseries. It’s a win-win; I get to see one of my longest known friends and I get to eat cake. We also think that eating cake more than once month, while tasty, won’t be thanked by our waistlines and we seem to have fairly busy social calendars (how did that happen?! I’m a homebody, I’m used to staying in all the time…), so once a month is perfect. The baked cheesecake was nice. Nothing special, but nice. Not heavy, had a hint of citrus in it. The tart, according to Krisi, was decent. She liked having fresh raspberries on top, but the crust was a bit dry and hard. She was also sensible and got a small mochaccino. No sleeping issues for her! 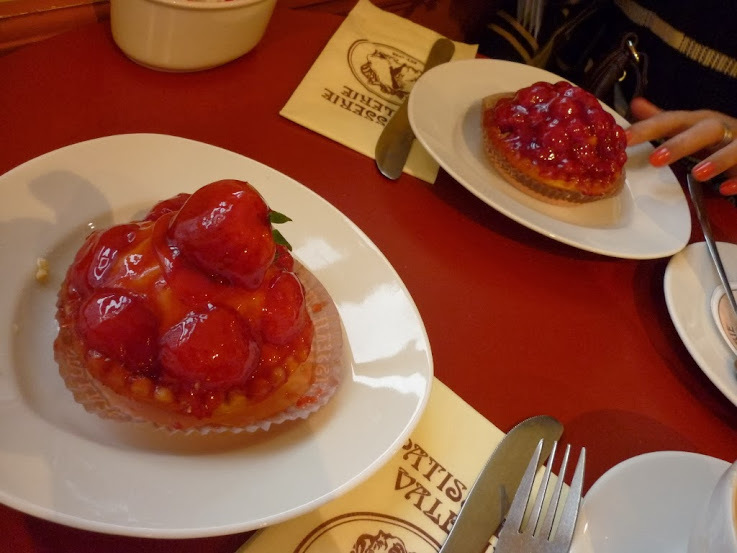 And these two tarts were from the Patisserie Valerie on Old Compton St. Really big, so you felt like you were getting your money’s worth. And this time I made sure to have a decaf latte since I had to be up early the next morning! I liked the strawberry tart I had, but it got to be really sweet fairly quickly. I think it probably would’ve been better without the glaze on top. Krisi felt the same about her raspberry tart. Crust was decent, filling was okay. A mix of the two tarts so far would be ideal. And dance! Which I did on my walk home on Friday night. I love going to the theatre. And now that I live in London? I actually get to go! 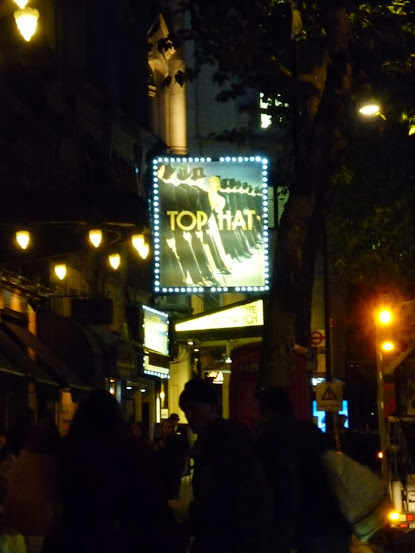 My friend Krisi and I went to see Top Hat to celebrate her birthday. She’d found a deal through LastMinute.com (I think that’s what she said) where we could get a 2 course meal and a ticket to Top Hat for just £24. Sure, our seats were up in the nosebleed section because come on, at that price, we weren’t going to get great seats. But that didn’t stop us from thoroughly enjoying the show. The dancing, the songs, the actual story… all of it was fabulous. I highly recommend seeing it if you ever get the chance. The show is leaving London to go on tour in 2014-2015, so you’ve got until this Saturday to go see it if you want to see at Aldwych Theatre. Can you tell I like horror? I went to the library today. 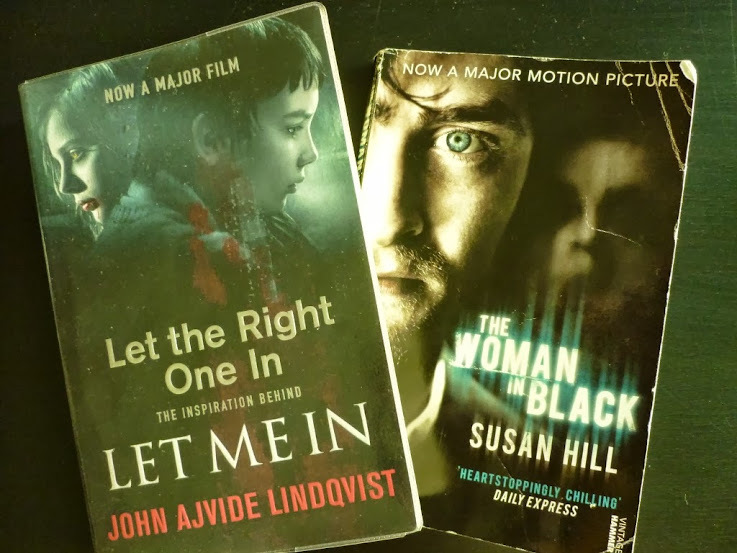 I specifically went to get Let The Right One In since it’s the book club pick for November, but when I saw The Woman in Black, I grabbed that too. I’ve seen the play, but haven’t read it. Nor seen the movie. The play was fabulous, so I’m really hoping that the book’s good too. The only thing that’s dampening my enjoyment of it so far (yes, I already started it, couldn’t help myself!) is that a previous patron has obviously used it in an assignment of sorts. There are tons of bits underlined in pencil (at least it’s not in pen?) and little notes in the margins. I’m trying not to be distracted by them all, but it’s not easy. I’m nosy and want to see what this person has to say about the story. But I want to read the story without outside influences first. And they’ve folded down the corners of the pages too! Someone clearly doesn’t respect library books. Since my current projects (socks and a blanket) aren’t inspiring me too much, I decided to cast on another cowl. It’s the stranded version of one of my designs (a double-knit cowl) that hasn’t been released yet. I really should get to work on writing up the pattern and getting it tested, huh? I procrastinate way too much. Anyway, when I picked out the colours for this, I had the recipient in mind. She looks fabulous in orange. But it wasn’t until I actually cast on and started knitting that it occurred to me: the dark grey and orange? 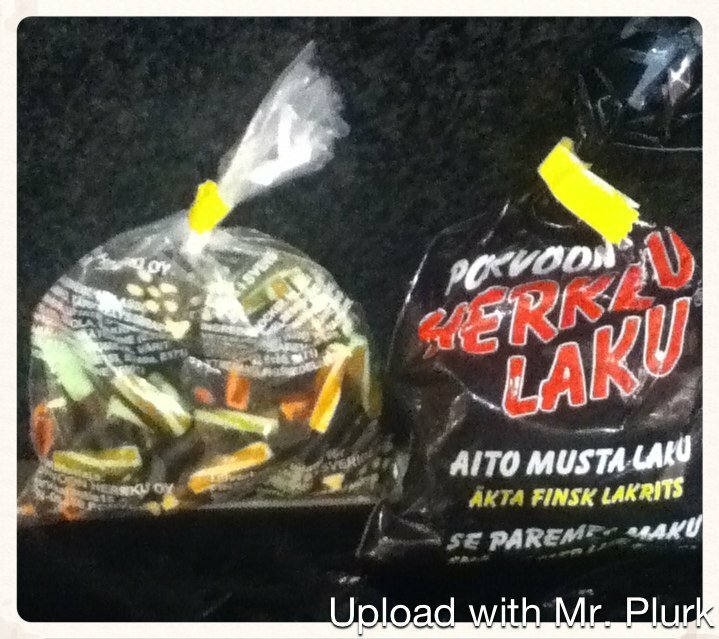 Totally Halloween-ish. At least it’s not black! And they do look really nice together, so hopefully she won’t mind. In an attempt to blog more often, I’m trying a different approach. I’m going to think of my posts as mini-postcards of my life. So! I went to Belgium last weekend to visit my sister. She took me to the market on Sunday morning where we had breakfast before doing her weekly grocery shop. 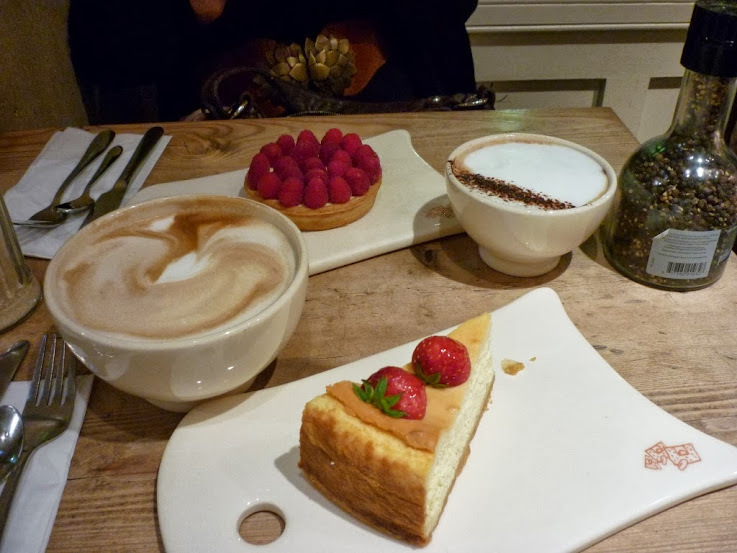 The mint tea was deliciously sweet; the galettes had smooth goat’s cheese and honey inside. Since they were spread onto the freshly cooked dough, the melted goodness dribbled down our hands as we finished them off. Definitely worth a visit. So jealous she gets to do it every week! I have the best friends. Look at what was waiting for me in the mail box!